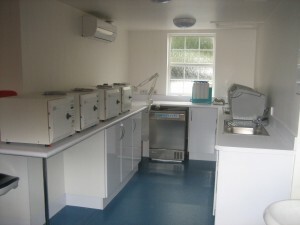 Here is a look at our completed room.From left to right it contains 4 autoclaves (sterilisers) on the worktop, an inspection lamp,an under the counter washer disinfector,a Quattrocare dental handpiece maintanence unit and 2 Ultrawave ultrasonic cleaning units. The temperature is controlled by the air conditioning unit on the left hand wall and the air flow to remove “dirty” air is on the right hand side of the ceiling. The right hand side of the room is where the dirty instruments start the cleaning process and the left hand side where the process is completed.